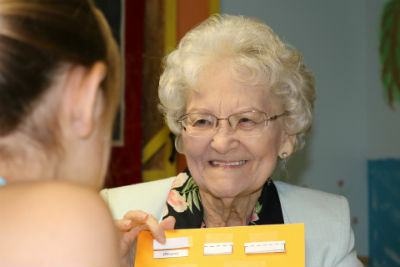 Photo: Teaching is clearly Beatrice Nitchman’s gift. 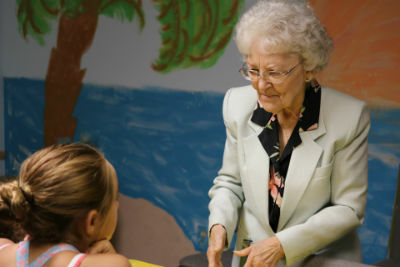 Miss Bea’s pursuits aren’t limited to ministry. On her fiftieth birthday, she parasailed over the Gulf of Mexico. On her eightieth birthday, she took her first ride in a hot-air balloon. Like an increasing number of senior citizens, she’s surfs the Internet and uses social media, but unlike a lot of seniors, she’s presently itching to jump out of an airplane! 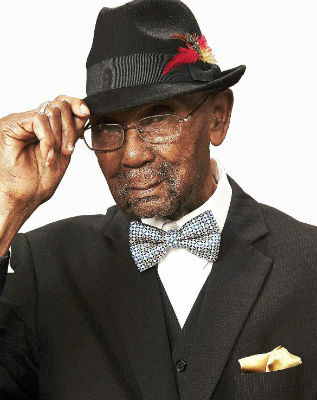 Photo: Willie Taylor at age 101. Were you blessed by reading this story? Support the ongoing work of Church of God Ministries with your gift to the World Ministry Fund at http://www.jesusisthesubject.org/world-ministry-fund/. Another way to give Bible stories new life and interest is through the new Speed Sketch curriculum from Warner Press, available this fall—same content, new interactive format! This entry was posted in All Church of God, Southeast and tagged Beatrice Nitchman, Earl Horne, Florida, Jacksonville, Judy Weeks, Miss Bea, Northside Church of God, Sunday school, teaching, Willie Taylor. Bookmark the permalink.